If the artwork stays like this, I think I might like this over the HMV edition. I'll have to wait and see. I like this artwork so when done with the right finish it will look good. no 3D? no 4K? just Blu-Ray? Is it confirmed the zavvi will have different art to HMV? Artwork isn't confirmed yet on either one so that's still the question. ??? Yeah I get that but I mean is there any confirmation that the UK has got a WWA and a WEA? If they are the same we can always merge the threads later. According to Zavvi rep it's just the standard Blu-ray. Judging by tne info over at Amazon.it I'm guessing there will be (at least) 2 VENOM steelbooks. Looks like the other way round in the UK though. 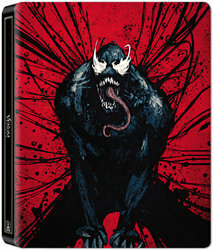 Officially licensed Venom T-shirt alongside the Zavvi Exclusive Steelbook for just £32.99. All you need to do is add both items to the basket and your discount will be automatically applied. No, it says: SOLD OUT! Damn! It was live earlier, I should have preordered while I had the chance.